One of the most mind-blowing implications of portfolio theory is that a well conceived portfolio has the potential to be much better, in terms of risk adjusted performance, than what we might expect from the sum of the individual portfolio holdings. Not incidentally, the name of our blog – GestaltU – relates directly to this concept. Contrary to the dominant framework of reductionism, which decries that the most effective way to understand something is to understand its parts, Gestalt theory asserts that many things can not be understood by understanding the components, because the ‘whole’ is greater than the sum of the parts. This is more obvious in some fields than others. For example, can a person intuit the qualities of water from an understanding of the properties of hydrogen and oxygen (without a deep understanding of quantum mechanics)? Can you effectively comprehend the experience of carrot cake from an understanding of the ingredients? The famous World Wildlife Found logo is an example of a Gestalt because the brain identifies that the conglomeration of irregular black shapes in the image is actually a panda bear. It is not the shapes themselves, but the orientation of the shapes and how they fit together that communicates the salient information contained in the image. Most investors pay much more attention to the process of identifying the individual characteristics of the assets they want to own than they commit to the process of identifying how well the assets might fit together in a portfolio. But what if the individual characteristics of the assets are less important than the way they work together? We’ve been meaning to get a post up on this topic for a while, but a recent paper published by Cass Business School and sponsored by institutional consultant AonHewitt provided the ammunition we’ve been looking for. Their paper, which is in two parts, is called ‘An evaluation of equity indices”. Part 1 examines ‘Heuristic and optimized weighting schemes’ and Part 2. explores ‘Fundamental Weighting Schemes’. This framework works beautifully to illustrate the relative importance of portfolio optimization versus fundamental stock selection because it compares the realized excess risk adjusted performance of pure risk-based optimization methods to methods based on traditional fundamental security selection. Note that the authors used a universe of the top 1000 stocks by market cap in each year from 1968 – 2012. In Part 1., the researchers describe a variety of ways to dynamically generate optimal stock portfolios where there is no effort to emphasize individual return characteristics at the security level. Rather, portfolios were assembled purely on the basis of how constituent stocks were expected to contribute to the overall risk of the portfolio, based on observations of the variance/covariance matrix over a trailing 60 month window. The authors then compared the performance of these optimized portfolios to the ubiquitous market capitalization weighted index, and the more competitive equal weight portfolio. It is beyond the scope of this article to describe the characteristics of the different optimizations applied by the authors (we highly recommend that you download the paper and read about the various optimizations), but Table 1. summarizes the results. Part 2. explores a variety of fundamental based methods of creating portfolios that emphasize the stocks with attractive fundamental characteristics. The authors create portfolios where stocks are weighted by qualities like dividends, cashflows, book values, and sales to see how these fundamentally weighted portfolios compare to the traditional market cap and equal weight indices. It is interesting to compare the two methods of portfolio formation. Note that the best portfolio optimization method (in terms of Sharpe ratio), MVP (minimum variance), delivered 10.8% returns with volatility of 11.2% and a maximum drawdown over the full period of -32.5%. On the other hand, the best fundamental weighting method, Sales-weighted (Sharpe was tied with Dividend weighted, so used Sortino to break the tie), delivered returns of 11.4% with a volatility of 16.2% and a maximum drawdown of -52.6%. Note that the Sharpe ratio of the MVP strategy was 0.5 compared with 0.42 for the Sales-Weighted strategy, and the Sortino ratios were 0.59 and 0.53 respectively. How is it that optimization alone can deliver better risk adjusted performance without any fundamental information about the relative prospects for portfolio constituents? Part of the answer is that optimization tends to indirectly tilt portfolios toward factors that are well known for adding excess returns over time. 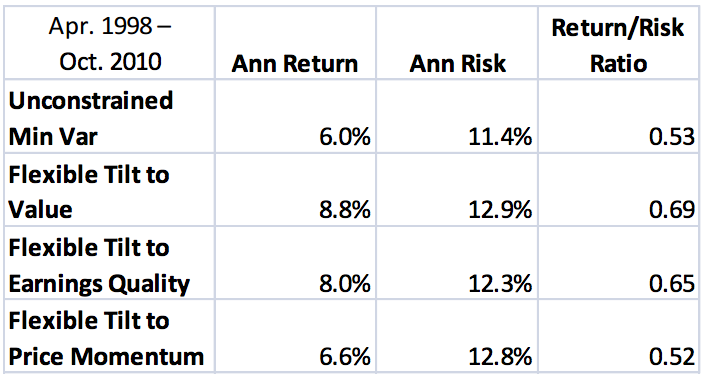 The following table quantifies the annualized difference between the return to the factor exposure of the alternative index relative to the market-cap index. You can see that the optimized portfolio derives meaningful alpha from a small-cap bias relative to the market-cap index. This is unsurprising. What is more surprising is that the optimizations tend to tilt portfolios toward the Fama French Value factor, and away from the momentum factor. Clearly there is an opportunity to combine fundamental stock-picking factors with robust portfolio optimization to deliver better results than either method alone – another Gestalt! The following table is taken from an S&P Capital IQ presentation published in December 2010. The authors imposed factor tilts on a minimum variance portfolio derived from constituents of the S&P 1500, with the results in Table 4. Note improved Return/Risk ratios from a combination of FF Value and Earnings Quality tilt portfolios with minimum variance optimization. Investors should take note of the opportunity for better risk-adjusted returns by considering more holistic methods of stock-picking rather than concentrating so much time and effort on identifying individual stocks with prospective characteristics. The whole really can be better than the sum of the parts.